It wasn’t supposed to end like this for the St. Louis Blues. After a stellar regular season in which the Blues finished second overall in the league, few expected the Blues to not reach the Stanley Cup Finals this season. With outstanding goaltending, balanced scoring, and a renewed dedication to defense, the Blues were supposed to be the threat from the West, representing the Western Conference in the 2012 Stanley Cup final series. The Blues’ script wasn’t written that way, and unbeknownst to the Blues, the Los Angeles Kings weren’t willing to play the role of doormat. They had their own script to follow, one that involved defeating the Blues in a surprising sweep. The Kings had their own stellar goaltending, riding Jonathan Quick‘s amazing performances, relying on their goalie to keep them in the games until their offense could kick in. It worked like a charm. St. Louis will now enter a long summer of reflection and disappointment, as their season ended far too soon, while the Kings move on to the third round, where they will await their opponent. They will face either the Nashville Predators or Phoenix Coyotes. Indeed, the Kings go down into the record books as the first team to knock off both the first and second place teams in the league since the Minnesota North Stars did the deed in the 1991. The Kings will be making their first Conference finals appearance since 1993, where they defeated the Toronto Maple Leafs in seven games. The only fact that matters is the fact that the Blues are done. All that remains now is to pick up the pieces, prepare for the draft and free agency, and come back strong next season. 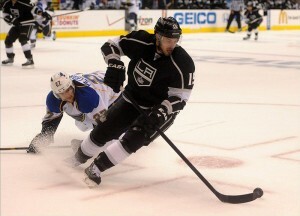 Dustin Brown and the Los Angeles Kings will be moving on, and the St. Louis Blues will be going home. In the playoffs, resounding joy can only be matched with bitter agony. Only a Stanley Cup win can wash the bitter taste the Blues have in their collective mouths right now. It is a win that will have to wait at least a year.